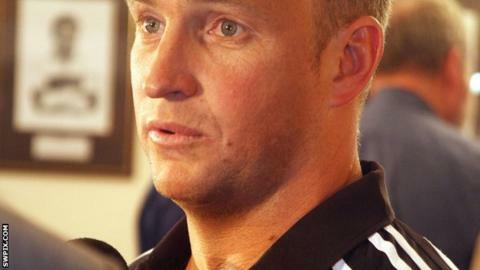 St Helens coach Nathan Brown believes local rivals Wigan deserve more credit for winning the double in 2013. Saints go into Friday's derby at Langtree Park as Super League leaders with a 100% record from eight matches. But Brown expects Wigan, who were the first side in seven years to win Super League and Challenge Cup in the same season, to contend for honours again. "I don't think they've been given the credit they deserve for that. Doing the double is very hard," he said. St Helens and Wigan shared one victory apiece in the two meetings between the clubs in 2013. Wigan won 28-16 at the DW Stadium in March, with Australian winger Pat Richards scoring two tries for the Warriors. But Saints gained revenge at Langtree Park in July, as Joe Greenwood's late try earned a 22-16 success for Nathan Brown's side. The Warriors are fourth in the table, six points behind St Helens, but have played one game fewer than Saints. Speaking to BBC Radio Merseyside, Brown continued: "They went to Australia [for the World Club Challenge in February] and that would have taken a lot out of them. That's a big trip to go on. "I don't see them being any worse than this time last year. They've got a game in hand and they're probably one win behind where they were, so for me they're as good as they were last year and they're a club we're trying to chase because they've got two trophies." Saints' squad will be tested by three games in eight days - after facing Wigan, they play Widnes on Monday and then travel to Leeds Rhinos for a Challenge Cup fifth-round tie on 26 April. "We'll be fielding what we feel are our fittest and in-form players against Wigan," added the former Huddersfield Giants coach. "We'll come in on Saturday and see what's available to go again for the Monday against Widnes. "The reality is that everyone who plays on Friday won't play on Monday, but there are going to be a fair few that do. That's the nature of Easter. We're all in the same boat and no one gets an added advantage, which makes it fair." Forwards Willie Manu and Anthony Laffranchi will miss the game against Wigan with thumb and arm injuries respectively. Tonga international Manu could miss up to eight weeks after dislocating and fracturing his thumb in the narrow win at Castleford on 11 April.